We’ve all seen those funny pictures of fat cats; some are even on greeting cards along with birthday jokes about eating all the cake. They are cute, funny and you just want to hug that fat cat. The truth is that these fat cats are not as healthy as they should be. Fat cats need exercise; most indoor cats will turn into couch potatoes (or cat tree potatoes!) if you let them. Indoor kitties need exercise, and most will not run and play without being helped a bit. Why Cat toys are important ? Cat toys are an important part of your cat’s health. Naturally, cats have an instinct to run, chase and pounce on moving things such as birds, butterflies, mice and this make these toys perfect for them. Toys also provide entertainment not only for your cat but you as well as watching a cat play is fun and entertaining. Some cats will take a liking to anything that moves when they bat or push it; others require more enticing toys that move on their own or with the help of batteries. If you’ve ever shopped for cat toys, you know how many different types of toy mice are available, from simple toys to sophisticated ones to pique the interest of your feline friend. Toys with batteries usually move a part, or parts of the toy and kitty just can’t resist the moving toy. A simple laser toy is inexpensive and a great way to get the attention of your cat, the toy emits a small red dot that you can move on the floor. The laser toy is irresistible to most cats and creates an interactive play between you and your pet. It is important that your “fur baby” have regular visits to the veterinarian. When you and your cat visit your veterinarian, he/she will weigh your cat as part of your cats“ checkup. If your cat is overweight, your vet will probably recommend a different food, diet, and exercise. The food can be measured, or the brand or type of food changed easily. It is more difficult to get a lazy, overweight cat to exercise. Cats, unlike dogs, are not going to go for a jog with you every day. Instead, cat toys are needed to encourage your cat to run, chase and pounce. You may need to try several different types of toys to determine which type of toy provides the most exercise for your cat. Cats usually become bored easily, so it’s good to provide them with a variety of toys and if possible rotate them after playtime to keep kitty interested. 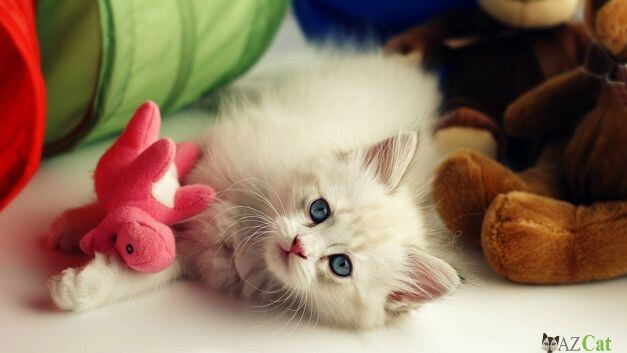 When your cat selects a favorite toy, allow him/her to play with it for a short time each day, when playtime with the favorite toy ends, put that special toy away and introduce another toy. Repeat the playtime each day for a few days, and your cat will soon “ask” you to play with them. If you’re looking for a perfect toy for your cat, then you can search the internet for a wide variety of toys, pet products, and many more. You can also visit our blog azcat.net for the best cat product reviews, tips to make sure you buy the right product.